Ideal for china cabinets, wardrobes and other inset doors. Another great choice to go to Rockler for my woodworking and hardware needs. Just received this lock to replace the one missing on an antique wardrobe I had purchased that was missing the locks. Looks like the lock that would have originally came on it. Needed a small quality and attractive lock for a wedding box for cards. This lock worked well and looks great. The locks are great and just what I expected. Shipping was rather slow but I wasn't in that big of a hurry. The lock was a direct replacement of the old one. The only problem was the screw was to weak and broke for the hard wood. Just as described worked perfect. Had an old curio cabinet whose latch was missing, the door held wedged closed with a matchbook forever. 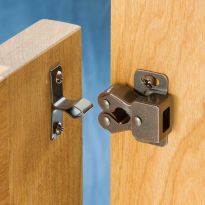 Checked out Rockler, and saw a latch that looked close to what I imagined would work, cheap anough to risk it. Well, it dropped right in and in 5 minutes was a solution to a very old problem, working very well. Perfect fit. The mounting holes and lock mounted exactly as my broken lock on my 30 year old grandfather clock. placed my order over the phone from one of their stores and saved shipping. The person I spoke to measured the mounting holes so I knew it was an exact fit. Thanks. This is exactly what I needed for my curio cabinet.. the fit was perfect.. Thank you..
this lock fit perfectly in the box and works great. Lock fit great. Easy to install. I have an antique cabinet from which the lock mechanism had been removed from the door leaving a empty cavity. Using a Dremel grinder I modified the cavity slightly and placed the new Cupboard Lock mechanism in the cavity. It is a very successful fix. Perfect size, perfect lock for my curio cabinet! Curio cabinet lock broke and this one was a perfect replacement and took about one minute to install. I am very happy with your product and look forward in purchasing more items in the near future because I have several antics that my wife needs fixing. Replaced curio cabinet lock. Very good quality! Looks just like the old one which was what I wanted. Bought a gun cabinet with 2 locks but was missing the key. This lock was an identical match and the key also fit the 2 existing locks. I'm quite satisfied. The lock worked perfectly. And would recommend using your company to anyone. AN GREAT LOCK FOR MY DESIGN. I WISH IT HAD 2 KEYS. This lock replaced a broken one in a curio cabinet. Fit like a glove with no adjustments. I would definitely recommend it. I needed to replace a lock on my wife's grandfather clock. This was an exact replacement. Works perfectly. I just ordered this item. It's identical to the broken one on my curio cabinet. The rest of my day should be so easy! 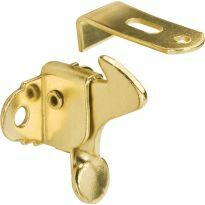 I used this surface mounted lock to fix my grandmother's broken curio cabinet. The lock was very nice and works perfectly. Now all the great grandkids won't get into Mamaw's breakables. 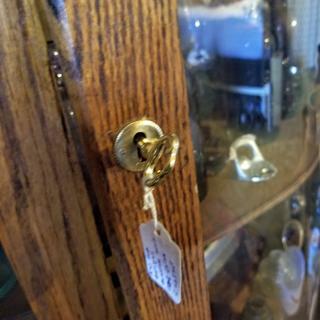 This lock was a perfect replacement for the one on our display cabinet. A real pleasure to find something that fits without major modifications! The replacement (extra) key,38149 had be filed down on the end of the tang to fit into the keyhole. I recently purchased a surface mounted lock to repair a roll top desk. The site was easily navigated, delivery was prompt, and the replacement matched the original. I recently purchased a corner china cabinet but the locking system was broken so I purchased one from you. I am very impressed with the lock as it looks just like the origional. Thank You so much. I am very happy with your product. Will recommend to anyone. I needed these for replacements on my gun cabinet and they went on almost identicle to original. They are working great, very smooth. This is an identical replacement part for an old antique curio cabinet. The lock we had quit working and we lost the key. I installed the new lock in a couple of minutes and it works great. The order arrived when it was suppose to and it's top notch. I needed to replace a lock on my mother's grandfather clock. This was an exact replacement. Works perfectly. I have 4 of the locks on my gun cabinet and ordered some replacement keys. I found that the 3/16&quot; barrel keys fit a multitude of old locks and ordered keys for an old 1900 vintage kitchen cabinet/hutch. Items were shipped very promptly and are good quality. I am in the process of moving and the lock on the curio cabinet that contains my collection of antique cars was broken. I found the exact replacement for the lock! Great company to work with, I received my item very quick! Thank You for making my purchase so easy! The lock on my curio cabinet broke many years ago and have been searching ever since. Got a Rockler catalog and there is was---perfect! Great company to do business with. This product was purchased to replace the lock on a china cabinet which broke years ago. I was unable to find a replacement anywhere, even in larger cities. Your product turned out to be an exact replacement and fit perfectly. The replacement is very simple. My only complaint is that this is the third replacement of the same locking system. Good luck, sturdy, however for the specific jewelry box i was using it for, the lock was not very deep, it only hits a couple centimeters from the door. So we added washers to gain depth. Rockler website is easy to navigate through and a good place to find hard to locate items. I located surface mounted locks for an upright cedar wardrobe in minutes. They were very reasonably priced. Quite satisfied with my purchase. I purchased this lock to install on a gun cabinet that I built. It functions quite well and installs very easilly. My only complaint was the lack of any instructions, it would have been nice to have had a drill bit size for drilling the key hole, but that was easy enough to figure out. Mimics antique originals to a &quot;T&quot;. Bought two. One of the keys was malformed and wouldn't work at all. Luckily, the one good key worked on both. I only used the inner locking part because these(keyhole covers) were not as well made as the original. Locks worked as needed. Watch out as the screws are weak and the head gets rounded too easily even with a pilot hole in oak. The lock is a little stiff, but generally works well. The tabs holding front and back together were not pressed down all the way on the most recent specimen I received, but I was able to get it to lie flat. I have used this lock before, and there may be some small quality control issues in its production. Nothing serious, though. 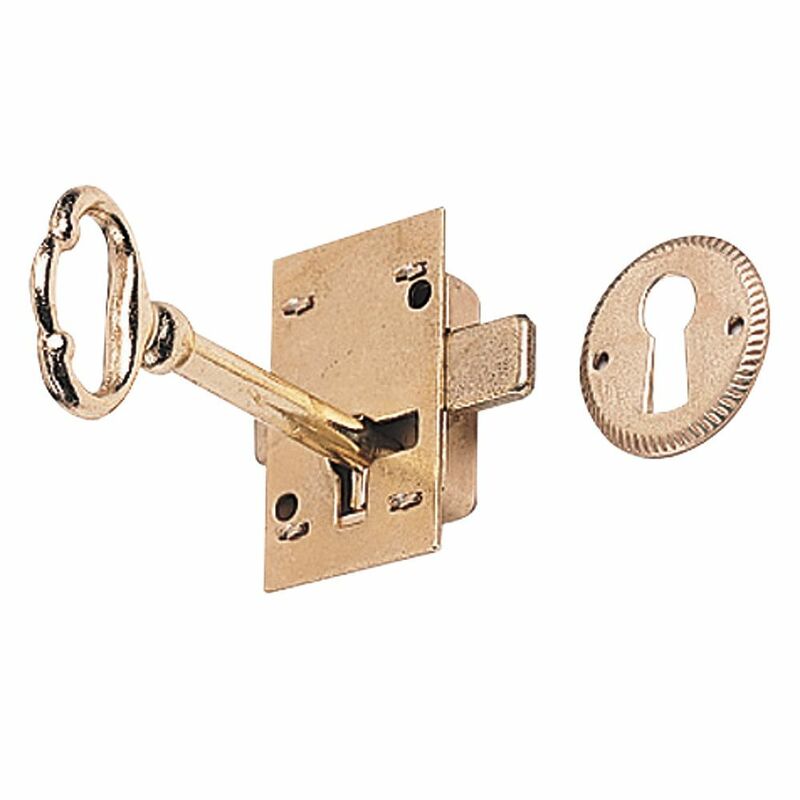 This is a perfectly good lock to use if you or your client prefer polished brass. For antique brass you need to go to another vendor. To replace a latch on a curio cabinet that I am chalk painting . I had purchased this lock previously for my mother's grandfather clock. It originally didn't have a key included; and that was the problem. The original key had help with sheering off the tang to operate the lock. A locksmith found it for me. To replace broken key and lock from an existing cabinet custom made. Exact replacement for current locks that the key broke. Made in Taiwan. We have a cupboard that needs a lock mechanism. 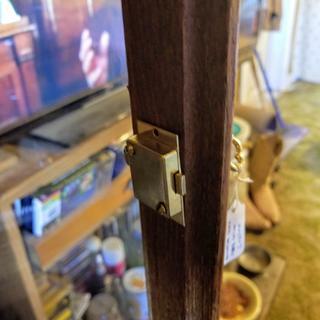 To replace a lock in a china cabinet where the key was lost when moving from one house to another. Stopped into your store a few weeks ago and was blown away by the amazing selection. I've been looking for a lock for a curio cabinet for several years, and this is exactly what I needed. I should have bought it while I was there, but knew I'd be shopping on your website. So....thanks for offering such a fantastic assortment of hardware items. Used to repair antique bow front hutch. I have an old Caro cabinet that has no locks and I wanted to make it look original. Easy find to replace existing lock on my bowfront. I knew Rockler had it. This is as close as I c an get to the original on my antique armoir that just broke a spring. Replacement for lock on antique secretary, hopefully. Lost th key to the existing one on the cabinet during a move, and not sure the keys that were for sale would work, so I purchased the whole set. I was able to open the door by removing the hinge pins. A replacement for the original that has jammed and will no longer work. Repair old china cabinet lock. Perfect replacement for the locks on an antique sideboard. I am replacing a broken lock in my curio cabinet; the replacement key looks sturdier than my broken one. I love the positive remarks from other customers about this lock and the company! Can this lock be used on lefthinged and right hinged doors? BEST ANSWER: Yes it can! As the locking bar slides thru left or right you do not even have to turn the mechanism 180 degrees and the key is inserted the same way in the right side or left lock placement . With this slide thru locking bar it could activate a security switch to indicate any door that is not locked. Quite a nice lock! what does the spine go into? BEST ANSWER: My install was on a grandfather clock. The surface mounted lock went on the door and the spine (lock strike) went into a slot cut into the frame of the clock. Hope this helps you. what are the dimensions of this lock? How long is the key? BEST ANSWER: the strait stem of the key is 1.25 inches, from the shoulder of the stem to the activating tab at the base of the stem that turns the locking mechanism.. The key works for a surface mount (interior) to a 3/4 inch thick door. The key is about 2 inches long. I built 3 wood boxes to be mounted on posts and put the locks on the hinged side door. Boxes are 1 foot on a side cubes. The locks work very easily. 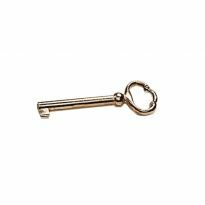 The total length of the key including handle is 2 3/8"
does the key come with lock ? Does the key come with the lock ? BEST ANSWER: Yes, it comes with the key. i haven't installed mine yet, but the quality seems high. I would give it a shot if you're on the fence. the key. The escutcheon was approximately 7/8" as I recall. 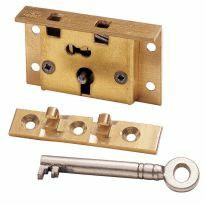 Does this lock & key kit come with: (a) a corresponding brass 'socket' for the lock bar to slide into when in locked position (b) the lockplate shown in the photo of the item? 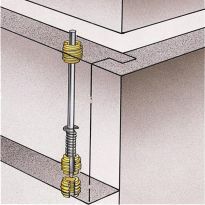 How far does the bolt extend beyond the lock body when in locked position? WHEN LOCKED WHAT IS THE LENGTH OF SPINE? BEST ANSWER: the spine is 1/2", but if installed according to directions, it will stick out 1/4"
Does it matter if the locks are right or left? Can the be installed however the door opens? 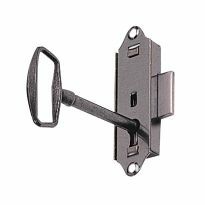 Is there a latch like this that does not require a key?